The picture above is an image of a squeegee I purchased for my shower a little while back. You see I have glass shower doors. One of the huge frustrations I've had to deal with is the constant build-up of soap scum clouding up the glass. The reason why my once, clear shower doors are now coated and have become opaque is because the water that pours forth from my shower is laden with minerals such as calcium, magnesium, bicarbonates, sulfates, etc. Not only did my hair have to contend with these potential harmful additives, it also had to deal with being exposed to chlorine week after week. It's a miracle, to me, that my hair made it to the lengths it has having been exposed to the same evil water that did this to my shower squeegee. So what exactly does hard water do to the hair and skin? The biggest culprit to healthy hair when you have hard water is the unwanted after effect of dryness. It's said that the minerals in hard water raises the cuticle layer leaving the hair feeling rough, dry and prone to tangling. If you guys remember the post on my relaxer stretch, tangles have been my achilles heel for the longest. Another negative side effect of hard water I experienced was the gradual fading of my natural hair color. Over time my hair slowly started to become light brown, slightly rusty color. I've even gone as far as to ask for a black rinse a couple of years ago at the salon to help combat this unwanted look. Mineral build-up on my hair also had a lot to do with my constant searching for effective hair products. If the water was leaving a layer of residue on my strands, it's only fair to say that some of the conditioners weren't as effective as they could have been had they not have to deal with the hard water. I would clarify constantly but sometimes I felt I had to work twice as hard to get the moisture back in. Let me also mention that hard water is the enemy of the scalp. Because of the layer of residue left behind, the scalp becomes dry and itchy. Existing scalp problems like eczema and dandruff are made worse when your water is hard. I couldn't even tell you how annoying it was to have to deal with dry hands and feet after the simple act of showering. Now imagine what my poor scalp had to deal with. Hard water is no joke. If you take a look below, you will see a color-coded map of the U.S. 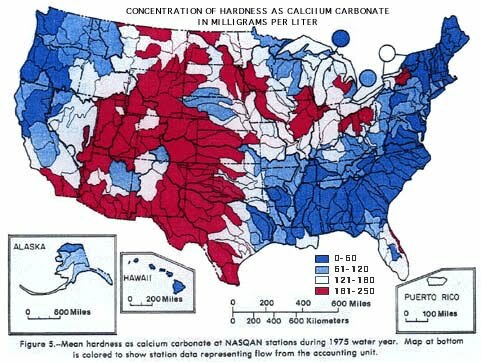 This map details the states with relatively hard or soft water. The parts of the map colored light blue, white and red are considered to be areas of hard water. As you review the map, I also ask that you not only rely on this information but that you also try to validate for yourself if you water is harder than you think. I Googled a hard water may for my state, according to the map, my general area should have softer water than the rest of the state. That notion is complete hogwash when you look at the white coating on my poor squeegee. Long story short, I have finally come to a place where I have found a solution to this hard water problem. Ladies, let me introduce you to the Water Stick. The Water Stick is unlike any other filter on the market. What you will find as you browse through the wide variety of shower filters online is that 99% of them only remove the chlorine. The shower stick, however, will not only remove the chlorine, it actually filters out all of the minerals leaving the water as soft as a new born kitten. I've always wanted a whole house water filter but didn't feel like making the monetary investment required of such a purchase. This Water Stick, to me, was like a prayer answered. The water filter was under $200 which is a fraction of the price of a whole house filter. I was also comforted by the fact that the filter will last between 15-20 years. The only maintenance required would be the recharging of the filter which basically means adding salt water to it when necessary. Ladies, the very first time I used this filter I could tell the difference. Soft water is unlike any other water my skin has experienced before. The water felt slippery and delicate. I was in heaven. I feel so much more confident now when I wash my hair that it is experiencing the full effect of the products I use. My skin also feels much less itchy and irritated now. I don't have to use as much lotion and skin moisturizers as in times past. Oh, and by the way, the Water Stick also has a chlorine filter attachment as part of the overall package. For those of you who aren't ready to make a $200 investment, there are other ways to combat the hard water dilemma. A rinse with apple cider vinegar helps to remove mineral build up. Shampoos with EDTA are another option but for those of us who are moving away from stripping shampoos to moisturizing cleansers, this option is not as desirable. I've even used distilled water as an alternative to mineral laden water that flows from my faucets. Instead of having to worry about which shampoo to use, or having to lug gallons of distilled water into the shower on a regular basis, I decided to go ahead and rid myself of this hard water dilemma once and for all. This is my way of educating those of you who are constantly struggling with dry brittle hair at the hands of the very ingredient that should be brining moisture to the hair....water. As you look online at water filter options, please be aware that all filters are not created equal. What you need to be certain of is the assurance that the filter you want to purchase is capable of removing minerals, not just the chlorine. For further reading, here is a thread on longhaircareforum where a member discusses her experience with the water stick. Great post, a water softener has always been on my list of must haves when I bought a house, but this product will work great in the mean time! I always noticed the softness of the water when I visited relatives in MS, sometimes it feels like you haven't rinsed good after a shower, but it is definitely good on the hair and for people with skin problems. I tell everybody with a child with excema to get a water softener and you'll have fewer reactions. Tell me about it, LaPreghiera, I didn't realize it was time to "recharge" my filter again and was using hard water. Immediately my skin was dry and my scalp started acting up again. Huge difference when I use soft water. I stumbled on your blog last night through an article I was reading where there mentioned it. I have tried to read as many as I could but I don't think I would be able to read all. So I've decided to take the last way out, I am a person who is totally reliant on her hairdresser and have no idea what to do, nut lately my hair has been breaking really bad. I have very thick, coarse, dry (in the summer it gets really oily)hair. I relatd with the texture of your hair and was just wondering if it is possible to send me a list of all the products you use, I would forever be indebted to you. You can email me bizz27@hotmail.com; I am sorry for any inconvience I may have cause and thank you for your time. I look forward to hearing from you. That map was very wrong for my area too. The hard water map on their site seems more accurate. How often will you have to replace the resin? @ Anon-That's the great thing about this filter. All I do is pour some salt water into the unit every few weeks. It requires simple table salt, not rock salt. The entire process took only a few minutes. O okay thanks, that seems really conveient amd easy. This is going on my to-buy list. A couple years ago I almost went bald from too much chlorine in the water. As soon as I got a water filter things got better. It really does make a difference. Interesting. My experience with salt water softener systems is different. I've had the keratin treatments 4X. After the 1st, my hair was great. After that, the treatments seemed to wash out of my hair quickly even tho I'm using sulfate & sodium free shampoos - I've even tried Wen.My hair still feels like straw. Our water softener maintenance guy said it's because of the salt in the system. His wife uses the reverse osmosis water on her hair because she has the same problem. There are no-sodium products for water softeners but they're very expensive. I will be trying it when our salt runs out. Does anyone else have this same problem with their hair? That is a very interesting point about the salt and it's affect on the hair. I'll have to look into it further for myself. Thanks for commenting! Wonderful blog. You really got the necessary point. I am loving this. Frameless Shower door enclosures are the latest bathroom remodeling trend. check it out! I must first say that I NEVER respond to posts of any kind.. guess I'm just secretive. But I could not hold back from telling you THANK YOU! I moved from Fl to CA where the water is terrible. My relaxed hair was unbelievably healthy and long until after my first year here in CA. Now my hair is brittle, CONSTANTLY dry & shedding, but thanks to your insightful blog, I know why. And I have every intention to get myself Water Stick.. asap. Thanks so much again! I found your blog page browsing for a related subject matter and came here. Thanks a lot for this and keep on sharing..